Like many seasoned shooters, I have a library of slides that I'm not using, simply because they haven't been digitized. Thanks to inspiration from Victor Kaijser Bots, who converted a slide projector into an automated digitizer, I've created my own high quality rig with components that I had on hand. My digitizer is a single-shot system that emphasizes quality over speed. I've dabbled with these projects in the past. The problem was always mediocre quality because of cheap optics. Olympus Image Share app running on an iPhone 5S controlling the E-M1 that's digitizing the slides in the projector. This rig solves that problem by using an Olympus 60mm f/2.8 macro lens with an Olympus OM-D E-M1. The Olympus 60mm has excellent edge-to-edge sharpness, plus a small barrel diameter to correctly couple with the slide projector. I simply remove the lens that came with the projector, then point the 60mm optic toward the illuminated slide. I remove the lens from the Leica P 150 slide projector and point the macro 60mm toward the image. I used the Olympus Image Share WiFi app to control the OM-D E-M1. The trick to making this rig work is to install a diffuser between the slide and the light source. This creates even illumination that's ideal for digitizing the image. I cut an piece of translucent plastic that was originally used for a portable light box that no longer worked. (I usually take apart broken items and salvage parts before discarding them.) I sandwich the diffuser with the slide and insert them into the single viewing slot on the projector. The diffuser (on the right) is placed between the light source and the slide. I used the Olympus Image Share app on my iPhone to focus and trip the shutter on the camera. This is really nice because I get a preview on the iPhone and have access to camera controls, without have to fiddle with the camera itself. Plus, I don't jar the E-M1 when initiating the exposure. The resulting digital images were very faithful to the originals, and quite easy to scan. 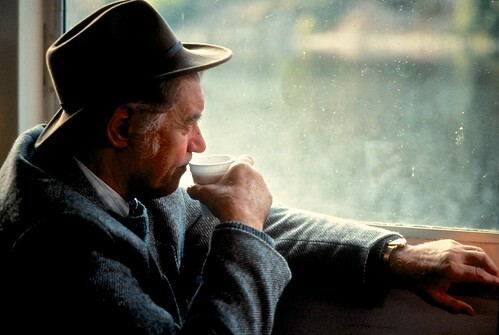 This portrait was captured on a train in Scotland in 1992 with a Contax 167MT and Fuji 100 slide film. 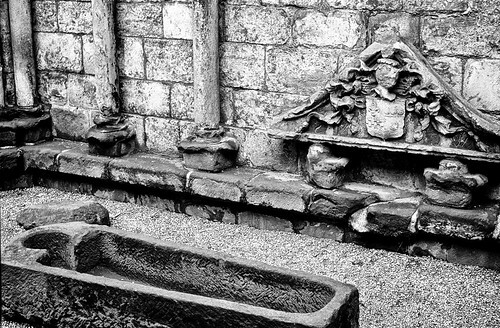 The picture below was captured with the same equipment, then converted to B&W using Nik Sliver Efex Pro. I could further automate this process by figuring out a way to mount the diffuser in the slide projector without damaging the projector itself. I still want to be able to present traditional slide shows with the Leica P 150. But I can tackle that challenge another day. 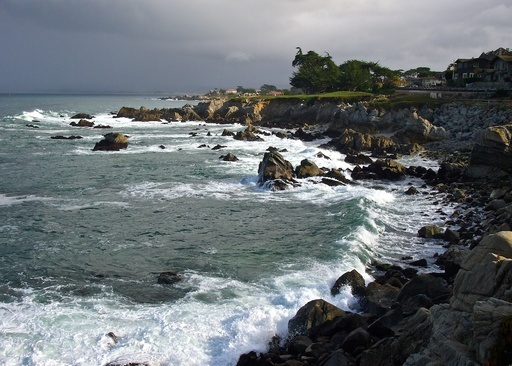 For now, I'm having a blast converting images from my past and adding them to my Aperture library. To learn more about Aperture, which is what I use to image edit and catalog my digitized slides, check out my Aperture 3.3 Essential Training (2012) on lynda.com. Also, take a look at our Aperture 3 Learning Center. Tons of free content about how to get the most out of Aperture. The key components were a Fujifilm adapter/lens hood for the X20 and an old Canon 1.5X tele extender that I had for my G2. I used gaffer's tape to connect the lens hood to the tele extender, then screwed the device into the front of the camera. I was able to extend my reach from 112mm at f/2.8 to 168mm with virtually no light loss. 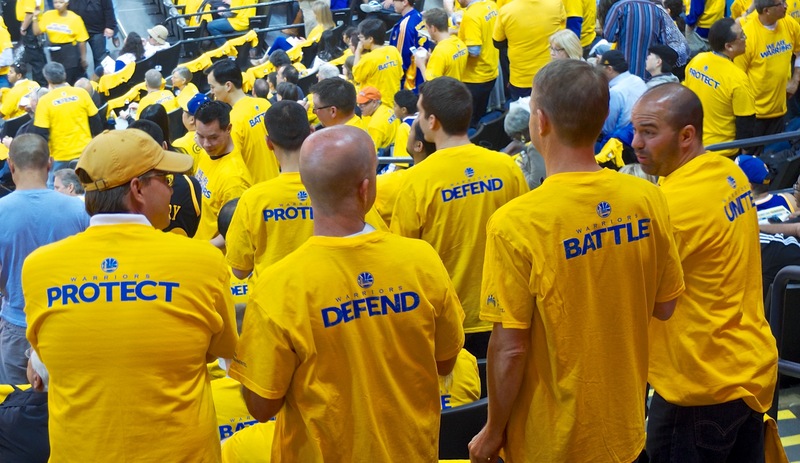 This made it much easier to capture candids during the exciting game, and even capture a shot or two of the action on the floor. I rarely let go of old glass, even if I'm not using the camera anymore. Because when I go into my lab filled with optics, adapters, and gaffer's tape, I never know exactly what's going to emerge. When you need to convert your purchased AAC (MPEG-4) music files to MP3, you can do so in iTunes 11 following these basic steps. In iTunes 11, open Preferences and click on the General tab. Click on the Import Settings button. Choose MP3 Encoder from the pop up menu. For the Setting popup, I recommend the highest quality. Click OK. Then Click OK again to close Preferences. Select the songs you want to convert. Go to File > Create New Version > Create MP3 Version. iTunes will convert your AAC file to the MP3 specifications you established previously. The MP3 version is added to your library. So you will have two copies of the song. 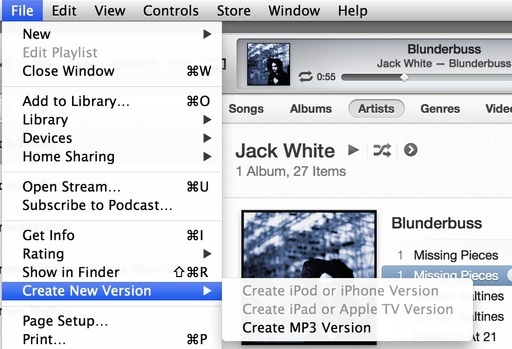 You can also right-click or control-click on the song and choose "Create MP3 Version" from the popup menu. Once you've created the transcoded versions of your songs, click on one in the iTunes library, then go to File > Show in Finder. 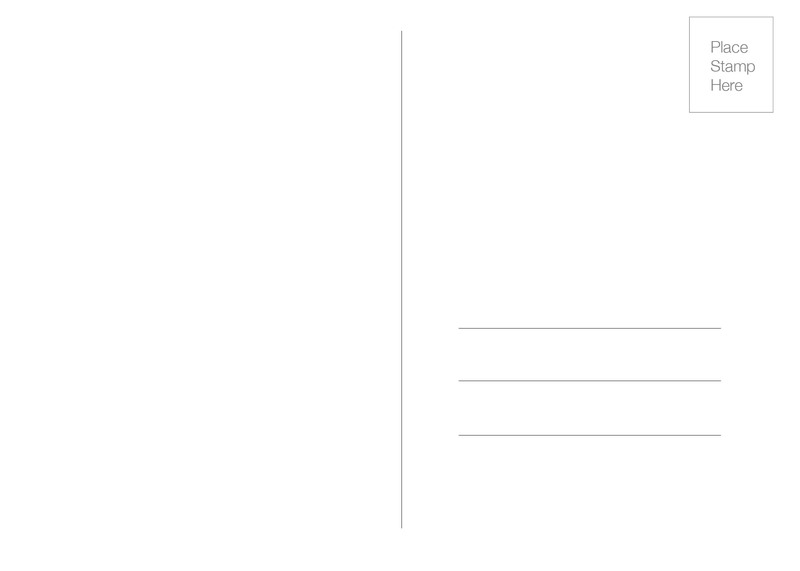 iTunes will send you to the location of your files. From there you can copy the songs to a flash drive, SD card, or other media for playback on an MP3-only device. 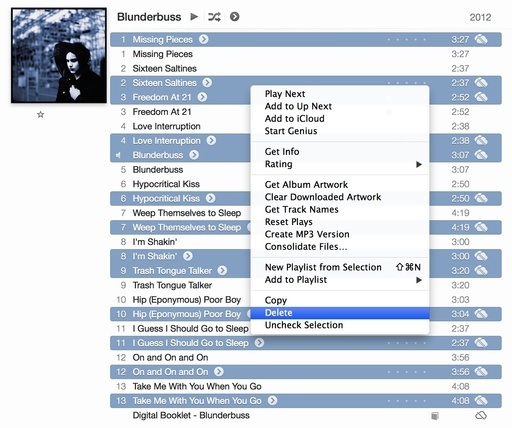 Once you've copied the files, you'll probably want to delete them from your iTunes library to save space. Click on the songs that have the "anti-iCloud" icon, then right-click or control-click on one of the selected and choose Delete. Make sure you don't delete your digital booklet if you have one in the album. They will be removed from your computer. I've used this process to create MP3 files to play off a flash drive for my car stereo. 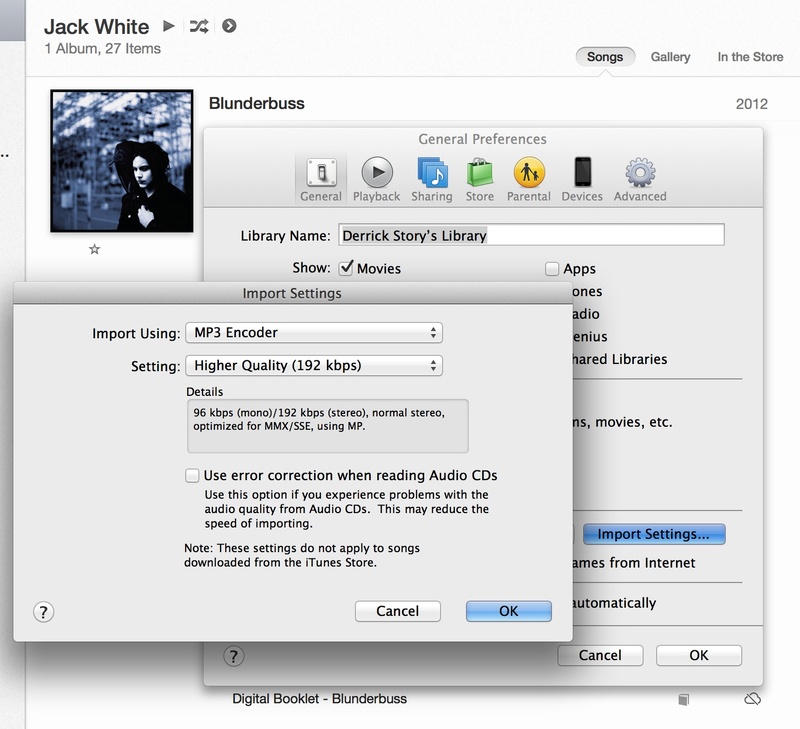 It's very convenient, the ID3 tags accompany the files, and you still have your masters safe and sound in iTunes. Want to have fun making a Valentine's Day card and delight the recipient at the same time? Take a look at Card Shop for the iPad. 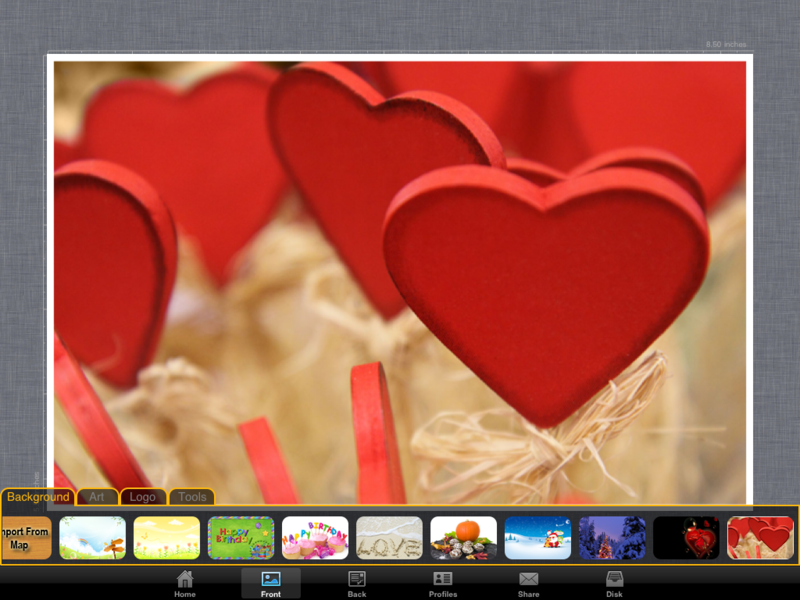 I've been playing with this 99-cent app, and have created some great looking greeting cards with it. So, pour yourself a cup of coffee, get out your iPad, and design a few cards right now. That way, you'll be ready when Valentine's Day gets here. Postcards present great advantages. In a mailbox full of bland envelopes, postcards radiate like desert flowers. They're easy to send: stick a 32-cent stamp on the back, write an address, and drop them in the mail. Postcards will bring smiles to the faces of good friends, or catch the eye of potential clients. And you may not realize it, but they're easy to make. Yes, you could use outside printing services for this, but why not create your own? Delight friends and family when a beautiful landscape appears amongst the bills and ads in their mailboxes. By downloading the postcard "backs" on this page for 4" x 6" and 5" x 7" versions, all you have to do is add your artwork on the front, and you have a professional-looking mailer that you can send, share, or even sell. You can use your choice of paper surfaces. Take a look at the Red River Postcards Info Page for affordable paper options, tips, and specs. 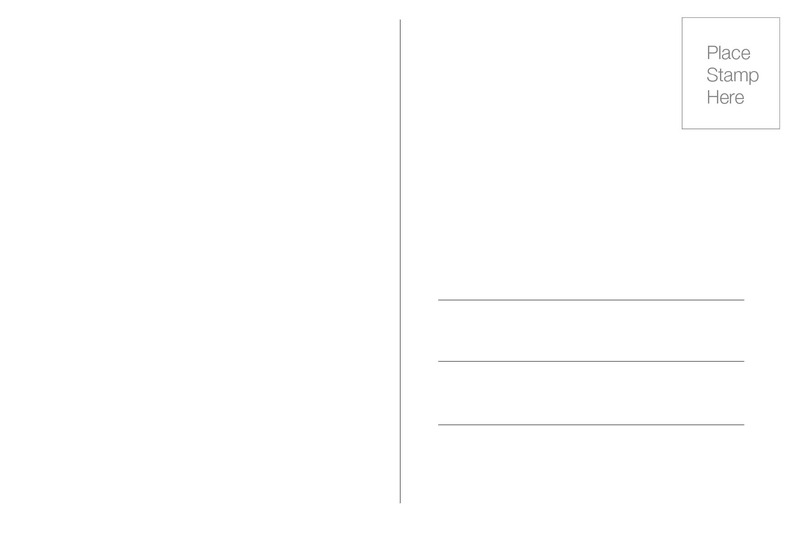 4"x6" postcard back template. Right-click to download. 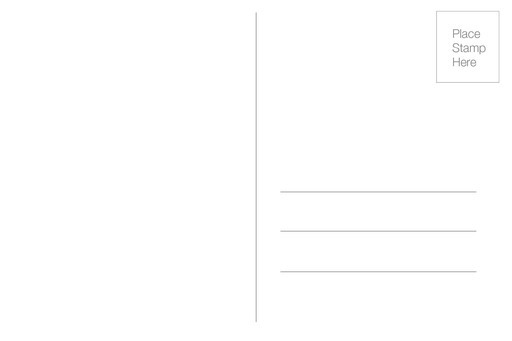 5"x7" postcard back template. Right-click to download. The best papers to work with are those that are at least 8.5 mil thick (which exceeds postal regulations) and have plain paper backs that make it easy to print the template and write an address. The links on the Red River page offer some good suggestions that meet these requirements. I like to print up a handful of templates to have on hand, then just run them through the printer again when I have an image I want to add. I also keep the digital templates on my iPhone, so I can create new postcards anywhere I find an AirPrint printer. If you want to stand out from the crowd, both for business or pleasure, postcards are a great way to do so. Print up a few, and see what you think. Like Red River Paper on Facebook -- Free paper give aways, printing tips, and lots more. When I travel, I'm impressed with the exercise bikes I see in modern hotel gyms. They have a complete multimedia setups that help pass the time while I'm peddling away. After I got an iPad 2 for a client assignment, I contemplated ways to put my original iPad to good use. 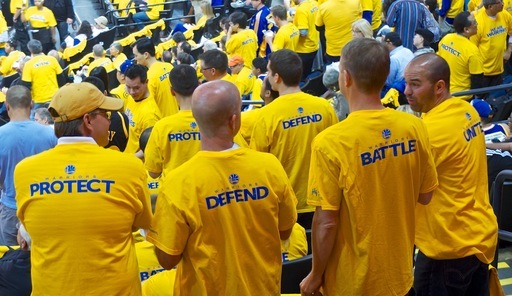 Then the lightening bolt struck: upgrade my exercise bike. 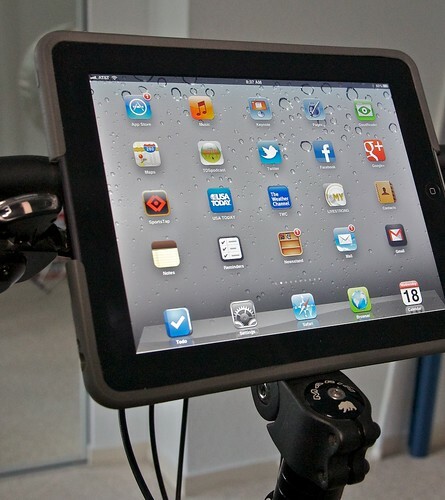 The iPad fits wonderfully on the handlebars. It's a great size for this use. But how to secure it? I used a modul R case with the optional hand strap. It protects the iPad and creates a snug fit. For the actual exercise, I use the CycleOps MAGNETO trainer with progressive resistance. 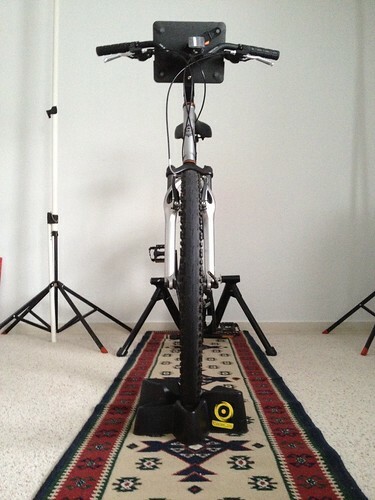 It's easy to set up, and it provides a good workout with my street bike. (I bought mine a while back at REI. You can get good deals on older models.) During dreary winter months here in Northern CA, I set the bike up in the shooting room at the studio. If I have an assignment I need to work on, I can switch back to photography in just a few minutes. Since I've added the iPad to this rig, I found that I'm riding longer, and loving it! I'm able to maintain my workout regiment regardless of the weather outside. 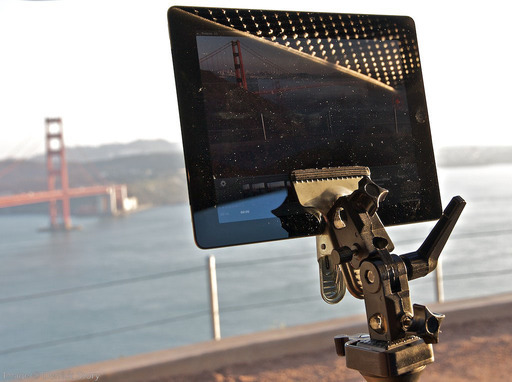 You can securely mount an iPad 2 to your favorite tripod for movie recording and time lapse photography. All you need are a few standard studio hardware items that may already exist in your lighting kit. If not, this article lists what to get and where to find it. OK, back to the hardware you'll need to make this happen. Flashpoint Clamp with 1/4-20 Stud ($9.95) - This clamp securely holds the iPad 2. 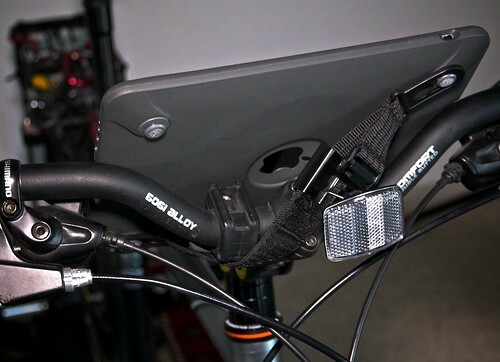 Make sure the rubber grips are in place so you don't scratch the screen. 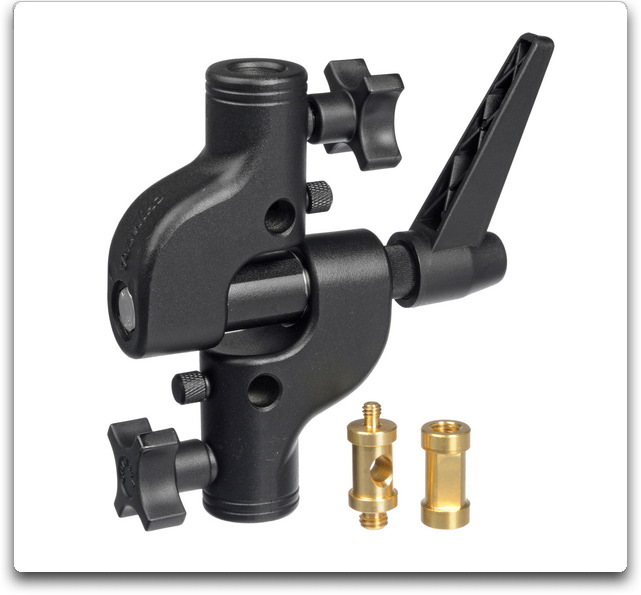 Chimera Single Axis Stand Adapter ($38.90) -- You put the Flashpoint Clamp in the top of the Chimera, then mount the entire rig to your tripod using the included threaded adapters. You can use other brands too, but make sure they include, or you already have, the adapters to connect to your tripod. This rig will work with any tripod. And the best part is, you can also use these pieces for off-camera flash and studio lighting. My personal rig that I used for shooting The Overlook time lapse movie. 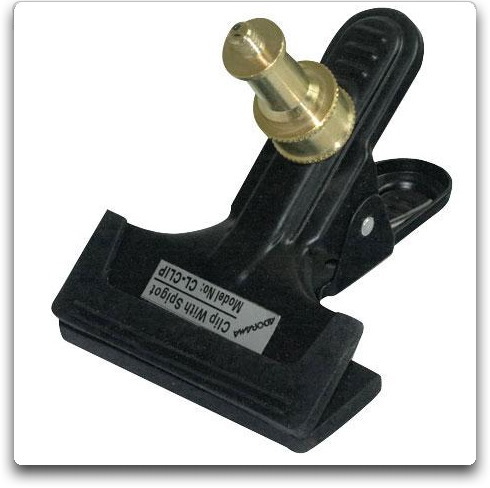 Someday I will pay $400 for Z-Finder Pro because they are clear, secure, and adjustable. But today isn't that day. Budget is too tight at the moment. But I do need a bright, crisp LCD magnifier for some upcoming video projects. So for the time being, I'll do it myself. 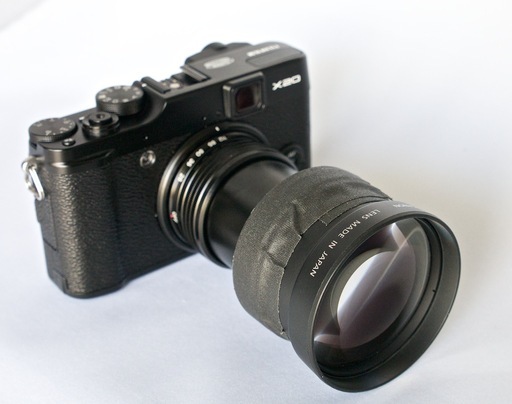 DIY LCD magnifier uses a 50mm f/1.7 Zeiss lens extended by using a Rayqual adapter. 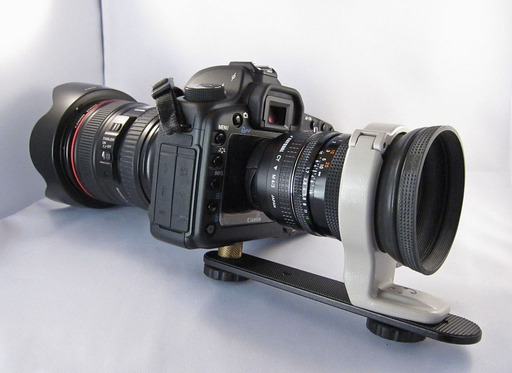 The mount is built around a Canon 70-200mm f/4 Tripod Collar. I went upstairs into my mad scientist lab and started playing with lenses and mounts. My magnifier is based on the old "reverse lens trick" to increase magnification. 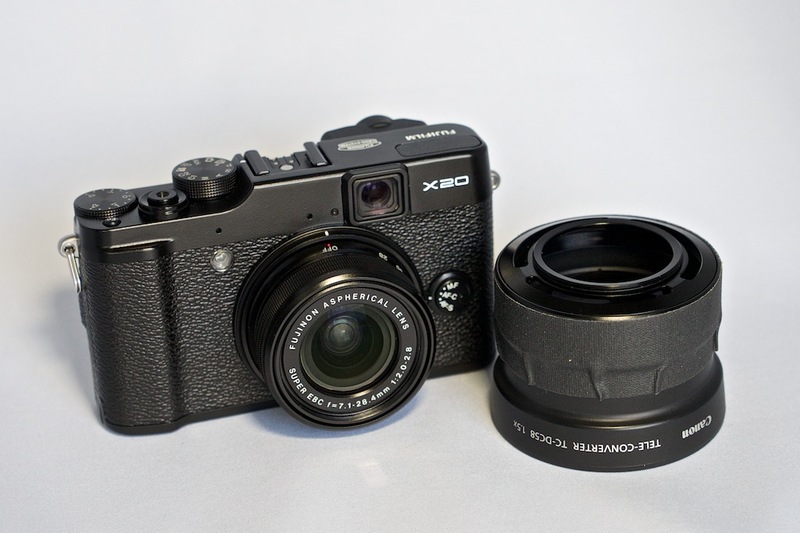 I chose a Zeiss 50mm f/1.7 lens because of its wide opening. To get the right viewing distance from the LCD screen, I needed to add a couple spacers. I used my Rayqual Micro 4/3 adapter because it also had a large diameter opening. It was close to the right distance, but just a tad short. 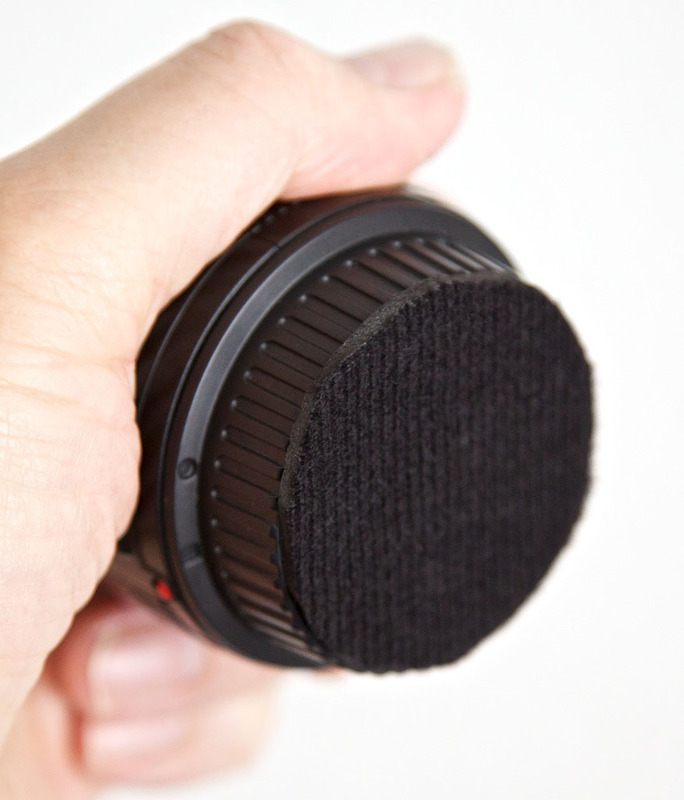 So I took a real lens cap, cut a large diameter hold in it, and mounted it to the Rayqual adapter. Perfect! I added a little gaffers tape to the open end as to not scratch the LCD on the Canon. On the other end, I screwed in a rubber lens hood to serve as my eyepiece. That way I can use the rig in bright light. I wanted something solid that didn't look too cobbled together. It dawned on me that the tripod collar for my 70-200mm f/4 Canon lens might work. You can get these cheap, BTW -- $12.99 from Meritline. For the bottom plate, I repurposed a flash bracket that had two tripod screws. One for the camera and the other for the Canon ring mount. The only problem was, it sat a little high. So I found a brass spacer in my lighting bag that lined everything up nicely. It doesn't look too bad, does it? Cons: The image is beautifully crisp, but it doesn't cover the entire LCD, only the central area. This isn't a problem when the camera is tripod mounted because I can set up the shot, then remove the magnifier. But for action shooting this would be a problem. At some point this DIY rig will drive me crazy. Hopefully by then I'll have the money to buy a real LCD magnifier. Until then, however, I'm in business. If you like do it yourself gear, be sure to check out our DIY Section here on The Digital Story. Lots of great ideas there. I use this technique for packing my Lowepro Fastpack 250 . The 70-200mm zoom lens lays horzontally in the camera compartment, then my 50mm sits on top of the barrel with the Cap Pad so as not to scratch it. 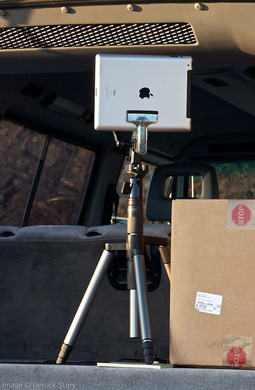 This method takes up less room than individual lens pouches, and it provides faster access too. The iPad belongs on a stand. Whether you're using it as a digital photo frame, or have it propped up while typing with a Bluetooth keyboard, a portable stand improves the situation. I've been using this simple wire display stand that costs around $2, folds up for easy transport, and is feather light. An Apple iPad on a $2 wire display stand. Click on image to enlarge. 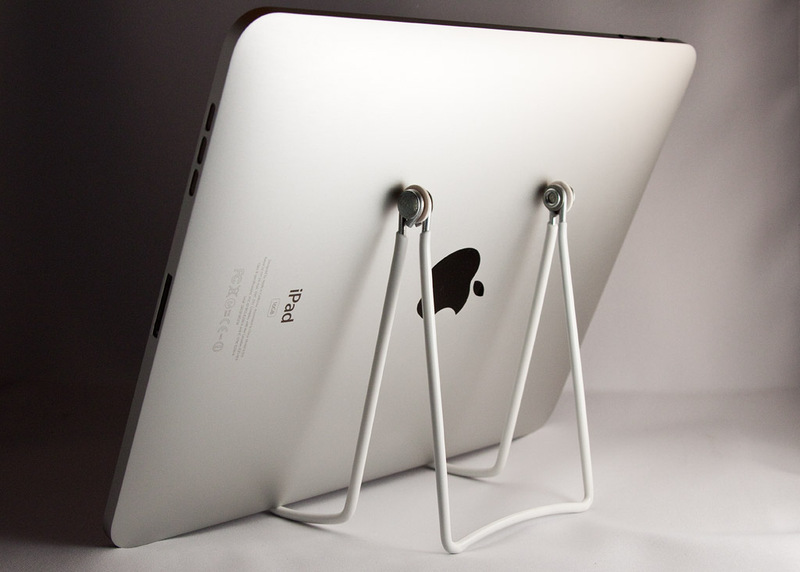 The steel wire is vinyl coated and the hinge washers are plastic so the stand will not scratch your brand new iPad. When you're on the go, this trio weighs in less than 3 pounds: iPad (1.5 pounds), keyboard (11.5 ounces), and stand (1 ounce). Traveling Light! 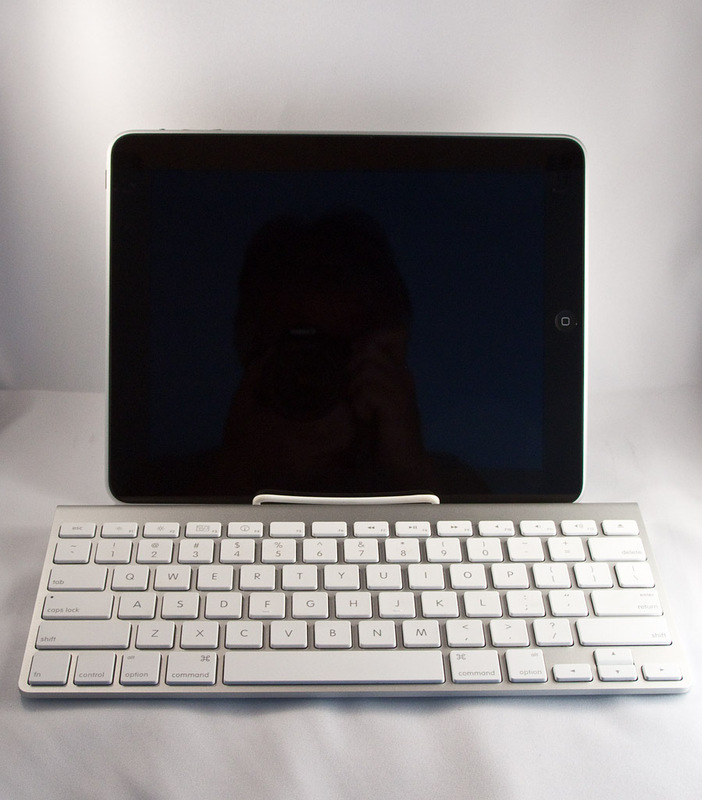 iPad, keyboard, and stand weigh less than 3 pounds. Click on image to enlarge.